In addition to the toolbar and shortcuts used in Windows, there are more modifications you can utilize to create a more efficient and functional desktop to suit more of your needs. These third party Windows programs offer what the standard interface does not… and they’re all free. KDE4 more widely known on Linux is now available on Windows XP, Vista and Windows 7 as well as Mac OS. While it’s not in its intended fully functioning state, it’s still in a very capable form that can accommodate the simple needs of being on the desktop. 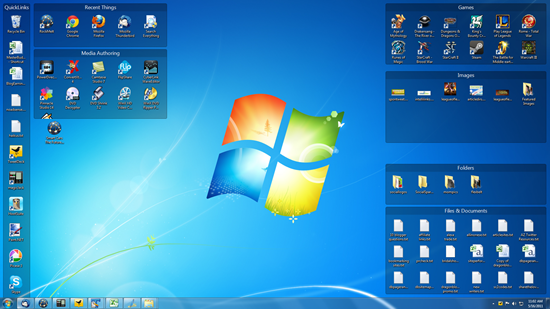 It creates not only a very sleek look to your desktop but helps keep it all organized. It’s a pretty much a new GUI that even lets you rotate windows, set transparency, group your desktop shortcuts, as well as many widgets among others. However because KDE is a port it’s not bug free and does still have many of its own issues. The company Stardock Corporation, which is more well known for their software gaming titles such as Demigod and Sins of the Solar Empire, has created a program called Fences. It’s similar to KDE4 in it’s approach to creating a more organized and efficient desktop. While fences is not as extensive and advanced as KDE4 it does offer the same functionality in organizing your shortcuts and re-sizing them to however you see fit. You just create a fence, drop the shortcuts that you want in there and set how big or small you want the fence to be. This program is also developed by Stardock and claims the number one spot in CNet’s desktop customization download ranks, which is for good reason (the number two spot is fences). ObjectDock gives you the coveted “dock” that Mac OS’s have, which is a stylized toolbar that has all your desired shortcuts, similar to a toolbar. You can customize it to how many items you want there, the size, zooming feature, auto hide, how big you want it and where. This gives you something Mac users won’t have, a dock and a toolbar. It also offers premium functions for the cost of twenty dollars for multiple docks, as well as others. We hope these Windows program can help make your PC tasks easier through better desktop organization.